In spite of the fact that it is not an original medieval building, it has been built to blend in with its surroundings. A town house style building, with timber beams on the upper parts of the exterior, sloping roofs and flower boxes. The hotel stands back from the street behind an attractive little courtyard, which gives a very Grand initial impression. Make yourself at home in one of the 78 individually decorated guestrooms, featuring iPod docking stations and flat-screen televisions. Complimentary wireless Internet access keeps you connected, and satellite programming is available for your entertainment. Private bathrooms with shower/tub combinations feature complimentary toiletries and bidets. Conveniences include phones, as well as desks and minibars. Be sure to enjoy recreational amenities, including a spa tub, a sauna, and a fitness center. Additional amenities at this hotel include complimentary wireless Internet access and shopping on site. It is a town house style hotel, with sloping tiled roof, attic windows and flower boxes. There is a parking area for both cars and buses, making this a particularly practical choice for groups. A stay at TOP Hotel Goldenes Fass places you in the heart of Rothenburg ob der Tauber, within a 15-minute walk of Gerlachschmiede and Rothenburg Town Walls. 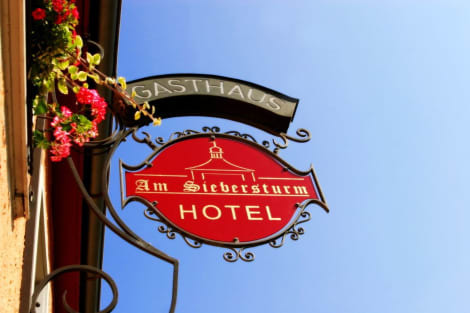 This hotel is 0.7 mi (1.2 km) from Kirchengemeinde Heilig Geist and 0.9 mi (1.4 km) from Siebers Tower. The exterior of this hotel is traditional. Featured amenities include express check-in, express check-out, and luggage storage. Self parking (subject to charges) is available onsite. Pamper yourself with onsite body treatments and facials. Additional amenities at this hotel include complimentary wireless Internet access, concierge services, and gift shops/newsstands. The Palace hotel is centrally located in the historic Rothenburg Herrngasse Street, between Market Square and the Castle garden. The Rothenburg train station is 900 m away. The hotel is a historic and a café in traditional style. The hotel has cable TV, comfortable beds and private bathroom. It has a restaurant offering a varied menu. The food is served in the garden terrace. Rooms are equipped with hairdryer. Stay in one of 30 guestrooms featuring flat-screen televisions. Complimentary wireless Internet access keeps you connected, and satellite programming is available for your entertainment. Private bathrooms with bathtubs or showers feature complimentary toiletries and hair dryers. Conveniences include desks and day beds, and housekeeping is provided daily. This is a traditional building. Make yourself at home in one of the 104 guestrooms featuring minibars. lastminute.com has a fantastic range of hotels in Rothenburg ob der Tauber, with everything from cheap hotels to luxurious five star accommodation available. We like to live up to our last minute name so remember you can book any one of our excellent Rothenburg ob der Tauber hotels up until midnight and stay the same night.